Hampton Four-Sided Vertical Rack - Our incredibly sturdy vertical racks are perfect for holding Dura-Bell and Chrome Beauty-Grips. They're space-efficient, which means they're great for home use and use in small areas. Made of powder-coated black steel with nylon cradles, with an octagonal chrome top. A special design means no pinched fingers when placing the dumbbells, and easy-to-read labels promote correct dumbbell placement. 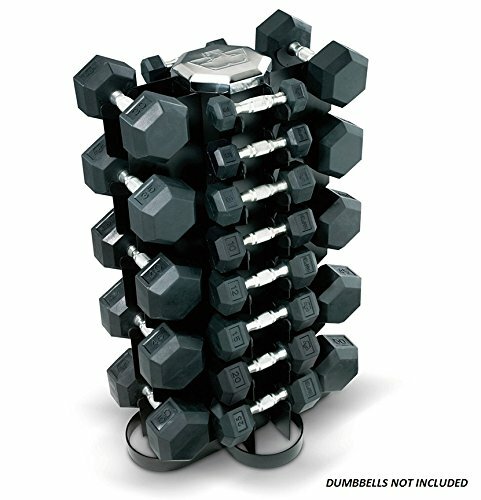 The Hampton Four-Sided Vertical Rack holds Dura-Bell or Chrome Beauty-Grip dumbbells, any 13 pairs, from 2.5-50 lbs. Stock photo shows dumbbells for visual demonstration only. Dumbbells are sold separately.